Today you can explore the whole of the castle, from the storerooms to the first-floor captain’s residence. A pleasant cycle path links Deal and Walmer Castles along the beachfront. This fort, or blockhouse, was built by Henry VIII. in 1139, at the same time as were those of Walmer and Sandown, on either side of it, and is of much the same character, though somewhat more complicated and stronger. 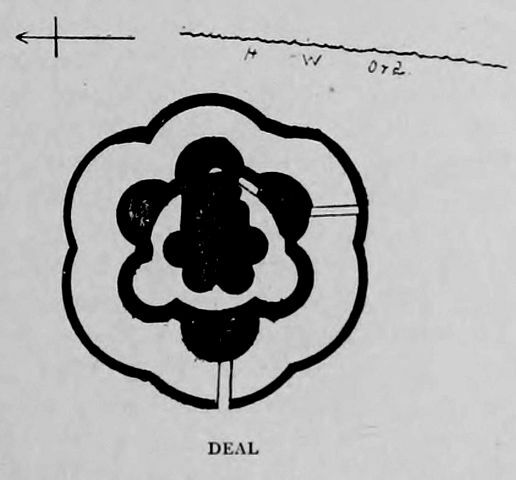 In the centre is a massive round tower, carried up with a square front to seaward, its foot being supported by four low semicircular bomb-proofs ; an area, or ditch, divides this from a girdle of six semi-circular lunettes, two of which are merely the counterscarp walls, the others being low casemated bomb-proof batteries, with embrasures for guns. The whole is surrounded by a ditch and counterscarp wall, built with six segments concentric with the interior buildings, and fitted with a drawbridge. It stands close to the S. end of the town of Deal, and immediately above high water line.